Oh man, no way could I resist Dark Remnants by L K Hill. I love covers that have an eye on them. Are they really the doorway into someone’s soul? Lovin’ that eye on the cover and it makes me feel like someone is watching me.Could it be the female protagonist, Kyra, or Gabe, the detective? Well, I say we all hook up and do some sleuthing. Abstreuse City is a very dangerous place. L K Hill does a great job describing it. the homeless, the garbage, the smells and the dark, the pimps and the prostitutes. Kyra and Gabe’s path collide when she finds out about a plan to turn the cops raid of a drug house into a slaughter house. She knew she had to intervene. 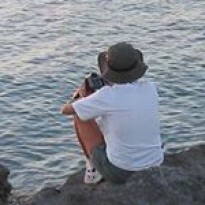 And…could they be looking for the same person? I’m not sure who Kyra is looking for, or why she is so curious about the dead prostitute, but I will find out. I wasn’t sure if this would grab me like it did with the funny names, like Slip Mire, but I quickly got involved. 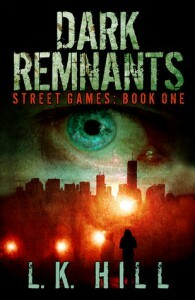 Dark Remnants is fast paced and action packed, just the way I like it. Kyra is hard as nails and quick on her feet, yet able to win the trust of others.She is able to read people, using it to her advantage. She looked like a junkie, from her spiky black hair to her black clothes with the hoodie and the track marks inside her elbows. Her eyes are so blue you couldn’t overlook them and she wears makeup to create a sickly pallor. She does no whining and crying, just has an intense desire to get the job done. Love a strong female character! 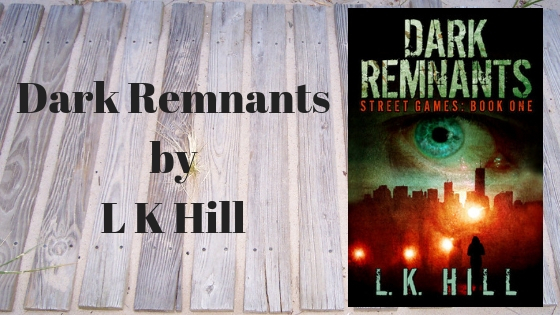 I voluntarily reviewed a free copy of Dark Remnants by L K Hill.